Katie has always loved Josh but he only looks at her as just another guy, his best friend forever. It doesn’t help that they grew up together since Katie’s mom Rosie has worked for decades at the Northern Star lodge, Josh’s family’s business. Josh is restless. He’s the only one among his siblings stuck taking care of the lodge. Everyone else has had the chance to get out of town and build their careers…but not him. So he wants to sell the lodge and get the hell out. Slowly they are rebuilding the lodge for an eventual sale. What they never expected is for their beloved Rosie to get sick. So Katie decides to stay over at the lodge to take care of her mother and help Josh with it. An accidental run in finally makes Josh see Katie as the beautiful woman he has always ignored. The attraction between them sizzles. And though Josh tries to ignore and fight his feelings, he eventually succumbs. At last Katie has her man. But is what they have enough to stop Josh from leaving and doing what he has always dreamed? I’ve said it before I will say it again. I am a sucker for happy endings. And I know that anything by Shannon Stacey, particularly anything Kowalski, is sure to have a happy ending, so it was a no brainer for me to read this book. An extra plus is the plot. I have always found stories of friendships that turn into love extra romantic and thrilling, and No, I never tire of reading these, so after getting the ARC copy I dove right into the first page and read straight through the night. Another un-put downable book by Stacey, All She Ever Dreamed may be my favorite Kowalski story yet. Also they are the best characters. It is pretty hard to choose which Kowalski is my favorite but I would say that Josh is pretty much it right now. I wouldn’t hold my breath though because based on the side stories within this one, another Kowalski book will be on the way soon I’m sure, that of Josh’s sister Liz and Mitch Kowalski’s best friend Drew. If you like your imagination tickled, with lots of thrilling and romantic moments in between, read anything Kowalski. Or better yet, read all of them! 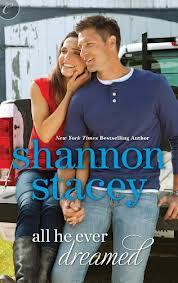 thanks for recommending this book and making a book review of shannon stacey. i'm also a sucker for friends into lovers story. looking forward for your future book review. glad i found your blog, and started reading all your recommended books.